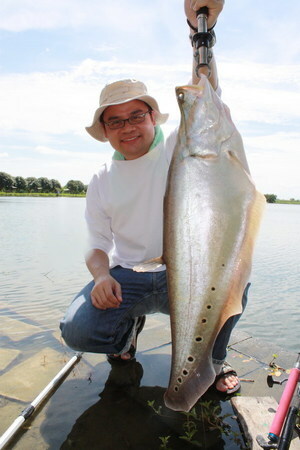 Visiting angler Jeffrey Yan visited Bung Buk Lake near Bangkok on a short five hour exploratory fishing session. Guided by Boy the angler fished a quiet area of the lake. Jeffrey offered small ornamental livebait’s which were carefully presented in the nearby margins on super sharp Owner Hooks attached to fluorocarbon hooklink’s. Jeffrey soon hooked a small Featherback which immediately leapt out of the water in an attempt to shake the hook from its jaws! After a short five minute battle the fish was landed and found to weigh 2.5kg’s. Several aborted takes followed which saw the anglers making a few minor alterations to their rigs in an attempt to hook the unseen predators. Soon after Jeffrey’s free-lined shrimp was picked up by another Featherback of some 4.25kg’s which once again threw itself from the water. Jeffrey went on to catch several more Featherback’s with weights between 2kg and 4.5kg’s during his short five hour session.